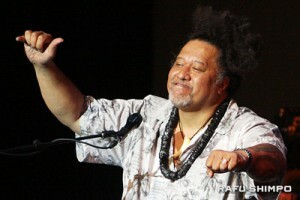 Went to the Willie K concert at the Aratani Theater on a Tuesday nite (March 12). Are you ready? It was totally filled up, unheard of on a weeknight. Produced by my good friend Gerald Ishibashi, he brought life back into the theater. Of course I expected to hear the Hawaiian version of “Over the Rainbow,” but SURPRISE AGAIN! As Willie said, “Many people expect me to sing dis song, but I did it my way.” In the true Judy Garland style. Refreshing. But that wasn’t the end of it. His range went from down and dirty blues, and a tribute to Lady Nina Simone (I lost it there) and his Puccini rock ukulele style. Sorry, I’ll never be able to listen to Hawaiian music the same way. There’s so much to hit on with his performance, but being overwhelmed I couldn’t get it all in. Fortunately, I was sitting next to my sweet friend NJ Nakamura, a triage nurse, and her husband Richard. The opening act was a young woman named Yoza, with the striking blue hair and the haunting perfect voice. I was surprised she had been around L.A. for so long and hadn’t hit any of the venues. But I’m sure we’ll hear more about her again. Loved her songs of love, betrayal, and not apologizing about it. Bravo, Gerald Ishibashi, for breathing life into the old theater. I saw many people buying the CDs and buying the concert series that was announced. To JACCC CEO Leslie Ito, and to the community, I believe we have a keeper. Let’s keep supporting our family.